The Valiquette Property is composed of one block totaling 104 claims covering an area of 5,563.07 ha. It is measuring about 13 kilometers in a SW-NE direction and is contiguous South West to the Duval main block. The property can be accessed by a Hydro-Quebec gravel road up to the Lac des Montagnes, and then by boat. An old winter road along the SE shore of Lac des Montagnes can be used for works. The Valiquette project offers strong lithium potential in a well-established area. The lithium pegmatites tend to occur in swarms in the volcano-sedimentary units. 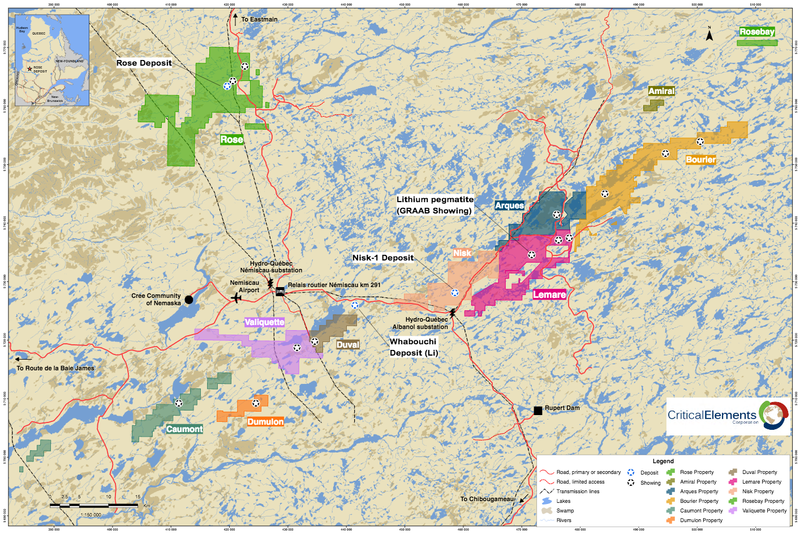 The Valiquette property covers a large part of the regional volcano-sedimentary unit, a favourable unit that hosts Nemaska Lithium's Wabouchi deposit and the Lemarre showing. The property is currently recognized for its magmatic nickel (Ni), copper (Cu) and platinum group elements (PGE) potential and host the Valiquette showing. The Valiquette showing is associated with a peridotite intrusions at the contact of the volcanogenic sediment of the Lac des Montagne formation. Historical results of surface sampling returned up to 1.75% Ni and 1.42% Cu (grab samples) and the best intersections returned from the 2011 drilling campaign are 2.66% Ni and 0.71% Cu over 3.2 meters, 0.78% Ni and 0.47% Cu over 4.8 meters, 1.15% Ni and 0.39% Cu over 8.3 meters and 1.47% Ni and 0.26% Cu over 2.5 meters (c.f. PR August 1st, 2011).